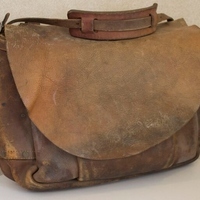 A traditional mail satchel worn by mail carriers to deliver their packages. The one shown in the picture was one of the series of leather satchels that were manufactured and used from 1868 until 1974, when they were phased out by the canvas satchels which are currently still in use. The leather satchels are quite durable, lasting up to six years compared to the paltry 18-month lifespan of the canvas satchels. In terms of weight, these leather satchels could hold 35 pounds, with mailmen often carrying two at a time if their route contained a large number of clients. However, many mailmen refrained from carrying two satchels at once in order to swiftly flee from any aggressive dogs whose favorite pastime was to harass the mailmen. "Mail satchel." United States Postal Service. 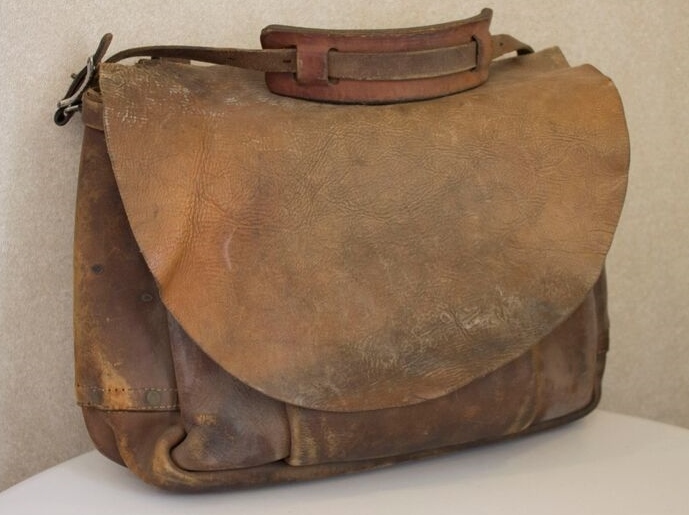 https://about.usps.com/who-we-are/postal-history/letter-carrier-satchel.pdf. “Mail Satchel.” RICHES of Central Florida accessed April 22, 2019, https://richesmi.cah.ucf.edu/omeka/items/show/5572.